As with all of my recipes, tweak to your heart’s delight. I’ll tell you how I did it , but you adapt this to your family’s tastes. 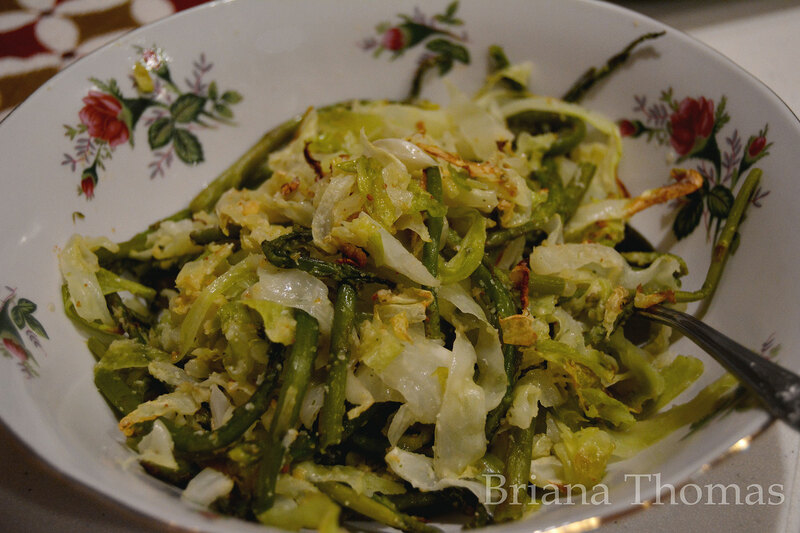 I served this with oven-roasted asparagus and cabbage. 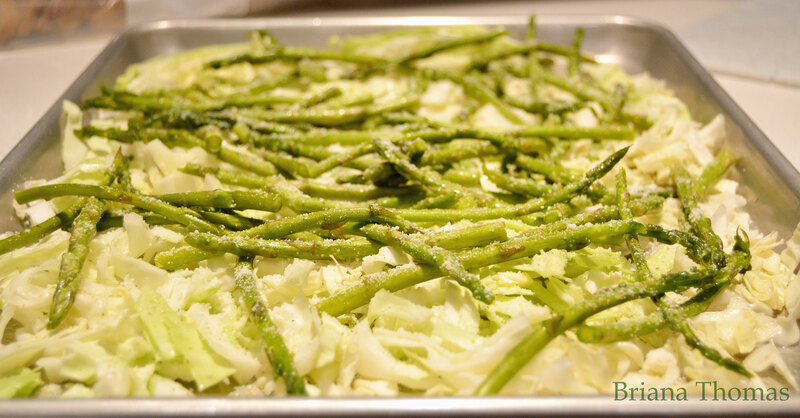 This is one of my favorite ways to make vegetables. Simply cut vegetables of your choice (I used cabbage and asparagus tips – the asparagus stems I am currently lacto-fermenting because I’m weird like that), spray with a little cooking spray (coconut oil spray would be ideal; if you Trim Healthy Mamas are eating S, toss with some olive oil instead), layer on a baking sheet, and sprinkle with some garlic salt and a little parmesan cheese from the shake container. Bake at 400 degrees for 25 minutes, stirring part-way through. I like to cook my own beans because it’s really cheap, it makes me feel adventurous, and there’s no nasty stuff in them. Soak your beans overnight for best results, then allow a good 2 hours for cooking. 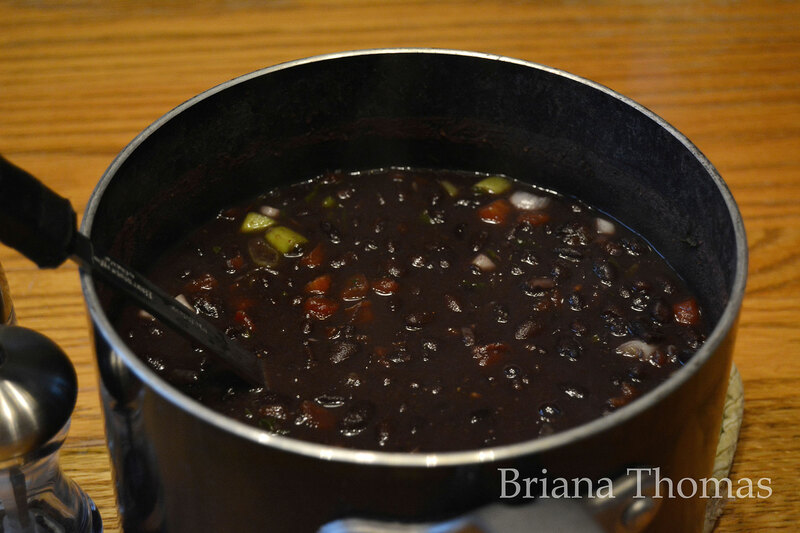 Mix all the bean ingredients together in a saucepan and heat. Add more water to thin down if desired. Taste and add salt if needed. Mix all the rice ingredients together and heat. I enjoy eating leftover rice and beans (cold) in a low carb wrap for lunch! 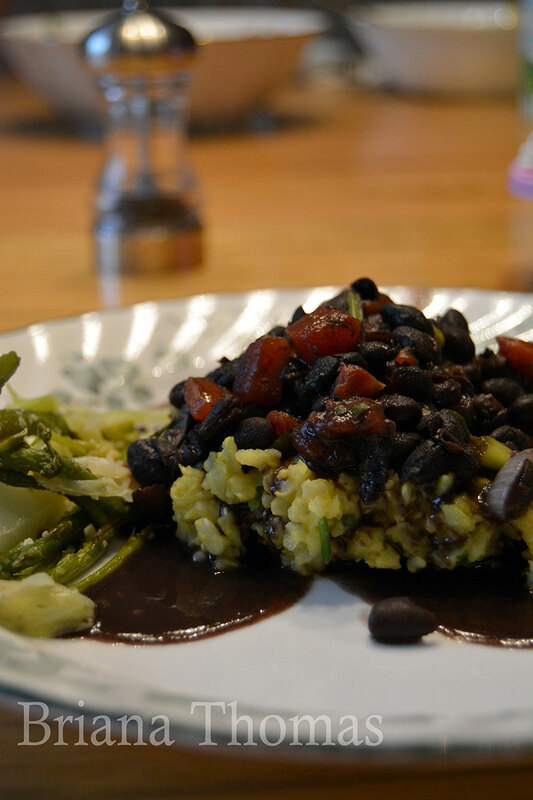 Have you ever made the rice portion in an instant pot? I think I may try that tonight. I’ll add all the rice ingredients at once before it is cooked, then cook it in the instant pot and see how it turns out. No, I’m afraid I haven’t! This recipe rocks! I just made it last night and had some leftovers for lunch. Even my 9 month old twins loved it. 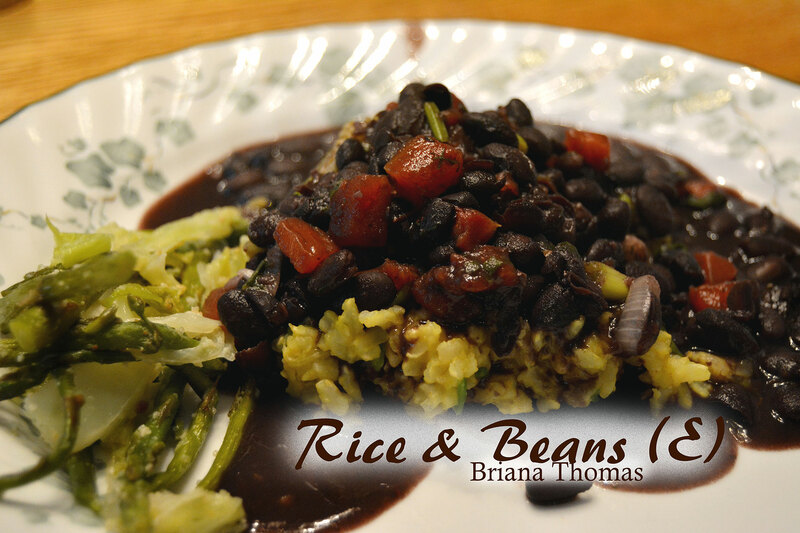 Hi Briana, wondering what the protein source is for this meal or if it is as I learned years ago that ‘beans + rice = a complete peotein? The addition of a turkey sausage would thrill DH so will have to look for that. Yum! I made this tonight. I don’t remember Rotel being that spicy, but it was still good. About halfway through the meal I decided to add some Greek yogurt and that helped cut down the spiciest a bit. We will definitely be adding this to our list of keepers. My husband especially liked the rice. I added the ingredients in the recipe before cooking the rice. 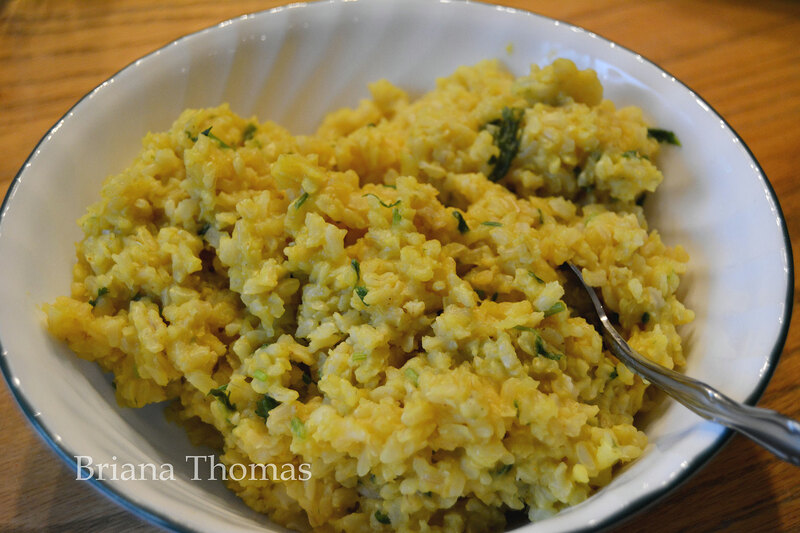 He is a big fan of the “yellow rice” from the store (he tried to Add a bag to the cart at Walmart the other day, in fact), and thinks your recipe is just as good! I’m basically using your Walmart edition meal plan this week, because I was to busy and tired to think up one myself. I’m not good at freestyle. Things tend to go bad in my fridge if I don’t have a plan for them! Thanks for another terrific recipe! I’m so glad you (and your husband) enjoyed it! This looks delicious! My dilemma is knowing how much to eat in an E setting. How do you measure out an appropriate serving so you don’t eat too many carbs? Would you be so kind to please post your favorite bread recipes (THM friendly) and the baking blend mix that you make. Thanks so very much! Side note: I am looking forward to making the bean recipe above! …sounds yummy!! I can’t wait to try this recipe!! Question 🙂 I might be able to swing this w/o any meat, but do you think I would be okay adding ground turkey to it? I can’t recall the fat in beans right now so I’m not sure if it would push it over or not. Sorry! Just saw someone basically asked the same question! That’s what I get for not reading all the comments 🙂 I will probably use 99% FF turkey to make sure I stay in safe range. Just wondering if I added smoked TURKEY sausage to the mix how it would end up? The Butterball Turkey Sausage that is hardwood smoked looks like it would still get me in with an E meal. The serving size of 2 oz has a total fat of 5g. 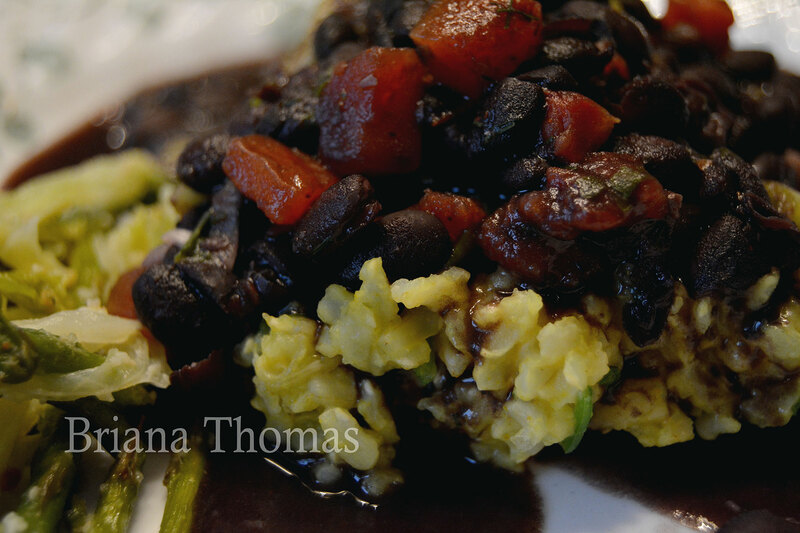 I am making this in the crockpot for dinner tomorrow night. I’ve soaked my beans today, and I’m just going to dump everything else in the pot in the morning and turn it on low! I’ve got my fingers crossed on how it will turn out! Thank you for all of your wonderful recipes. I “stalk” this site since being on THM for 6 weeks and only losing 6 pounds (on a good day). I’ve got to get more on plan recipes, just so that I’m not making mistakes without knowing it. Hi Mandie! I bet turkey sausage would be really good in this! Just keep your fat to 5 grams or less per serving and you’ll be fine. I would probably fry the sausage separately and add it in at the end before serving. Let me know how the crockpot idea turns out! First of all, my family LOVES this recipe! I, too, add sausage for the “menfolk” 🙂 (and occasionally have a few bites of it too, even if it’s a crossover!). 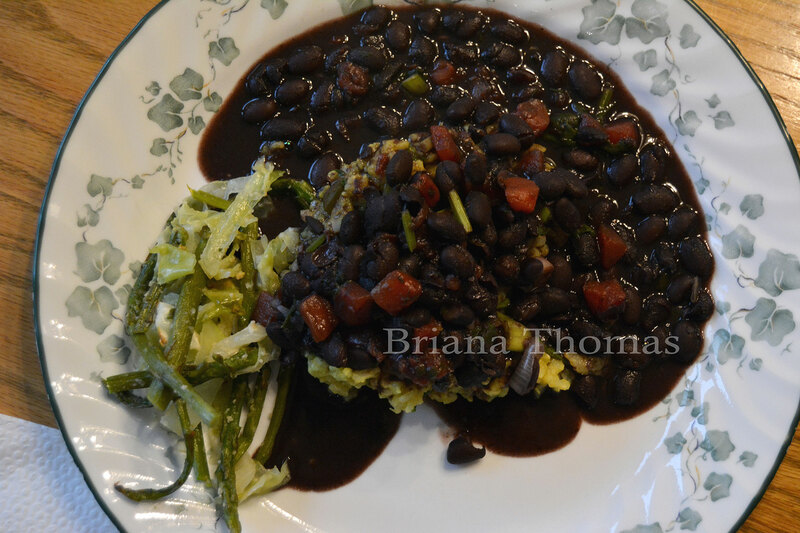 Question- is it possible to use canned black beans in a pinch?! I’ve only ever done the dry but am just wondering if that’s possible… Thanks so much! Oh, no problem. I think you are my favorite commenter. 😉 Btw, there’s a one teaspoon fat limit for E meals, not two teaspoons. It’s 5 grams of fat, and usually a teaspoon of butter or another oil like that contains about 5 grams. This looks yummy and I am making it right now! :) I’m planning on using it for E lunches throughout the week…but it’s going to be more than enough. Have you tried freezing it as well? I’m hoping I can freeze half the batch for lunches for next week. You are a very talented chef! I love your THM recipes. Thank you for sharing! !